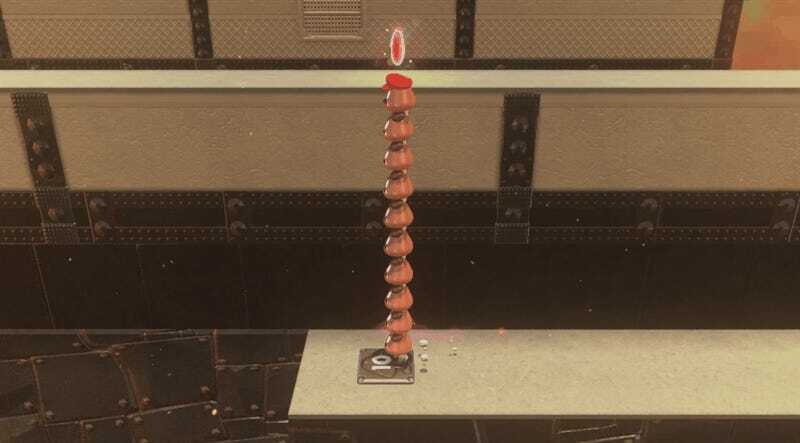 One thing I love about Super Mario Odyssey is how often it anticipates me. Odyssey seeks to strike a balance between structured challenges and open-ended play. It achieves that balance with remarkable consistency. Each level is a toy-filled sandbox, loaded with springs, levers, and buttons for you to bounce, pull, and press. The game feels so fundamentally good to play that it’s easy to spend an hour just doing stuff with no clear goal. Of course, each spring, lever, and button is usually a part of one or more carefully laid-out challenges. I can be messing around one minute, then find myself amazed at how the game anticipated and rewarded me for what initially seemed like aimless experimentation. Last night I played through the final third or so of the game, up to where the story ends (or, “ends”) and the sprawling post-story collect-a-thon begins. Near the start of one of the last levels, I came upon a series of large descending stairs populated by a bunch of hat-wearing goombas. I threw Mario’s hat at the first goomba and possessed it, as you do. Then I jumped onto the three goombas nearest me, stacking them up, because of course I did. 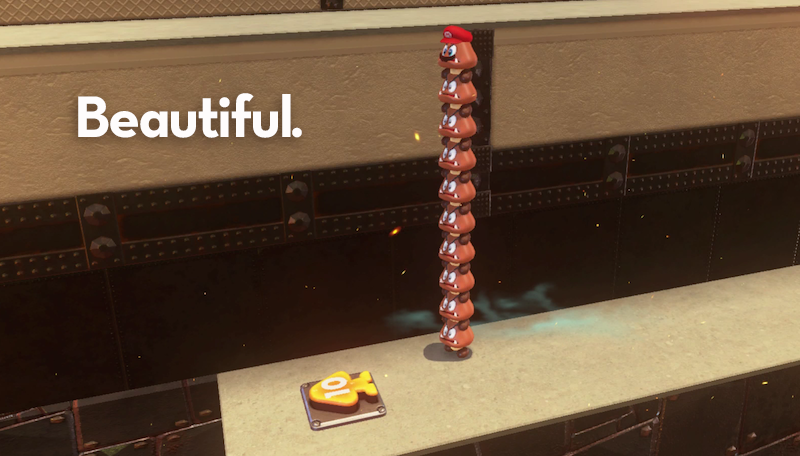 Then I made my way down the stairs, carefully stacking goombas as I went. Again, I did all that because of course I did. Lo, a button on the ground that would only activate if I stepped on it with a ten-stack of goombas, which happened to be exactly how many goombas there had been on the stairs. That sequence of events is a perfect encapsulation of what makes Mario Odyssey such a joyful game, and of the specific way Nintendo encourages people to play. Mess around, the game tells you. Take your time, see what you can do. If you manage to do something really cool, or reach some improbable rooftop, chances are the developers have put something there to reward you. It’s their way of saying, we knew you could do this, and we’re proud of you. When I finally drove my goomba-tower onto the platform, the moon didn’t appear directly above Mario’s head. Instead, it appeared on an adjacent platform that required one last little leap—out of the goomba stack—to grab it.